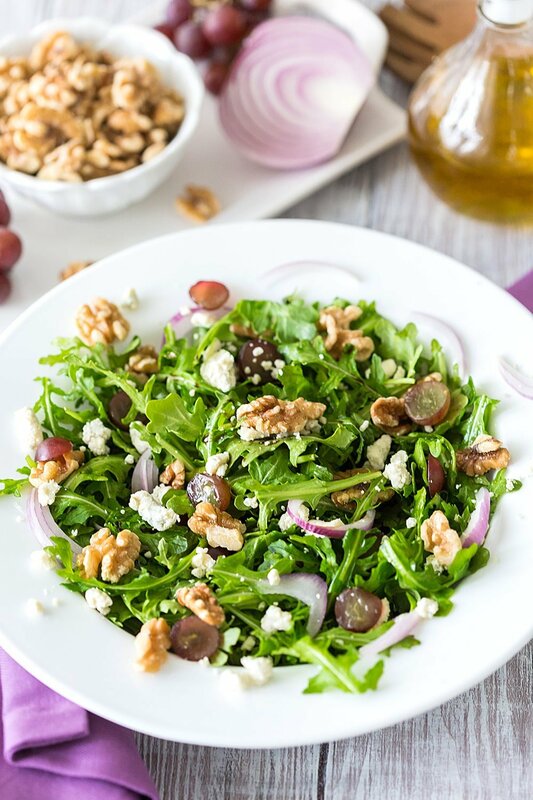 This arugula and walnut salad drizzled with olive oil and fig balsamic is easily in my top 3 favorite salads of all time! Happy Spring, friends! While we finally enjoy a little bit of warmer weather, I’ve been focusing quite a bit on switching out the heavier winter dishes (and all that Easter candy) for something a little lighter. 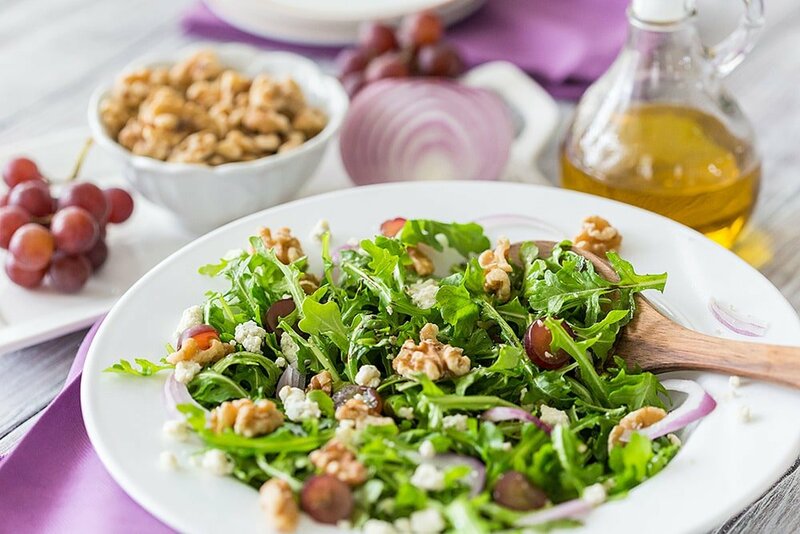 My husband and I have the world’s biggest sweet tooth, but we both agree this arugula, walnut and fig balsamic salad is hands-down, the best salad we’ve ever eaten. It’s such an easy salad to pull together which also makes it an A+ dish for any dinner party or group gathering. I’m sharing our favorite “version” but we like to switch it up occasionally and swap in various fruits like fresh figs or peaches when they are in season. One of the ways I’m adjusting our diet is swapping out the bad fats and adding in the good fats. 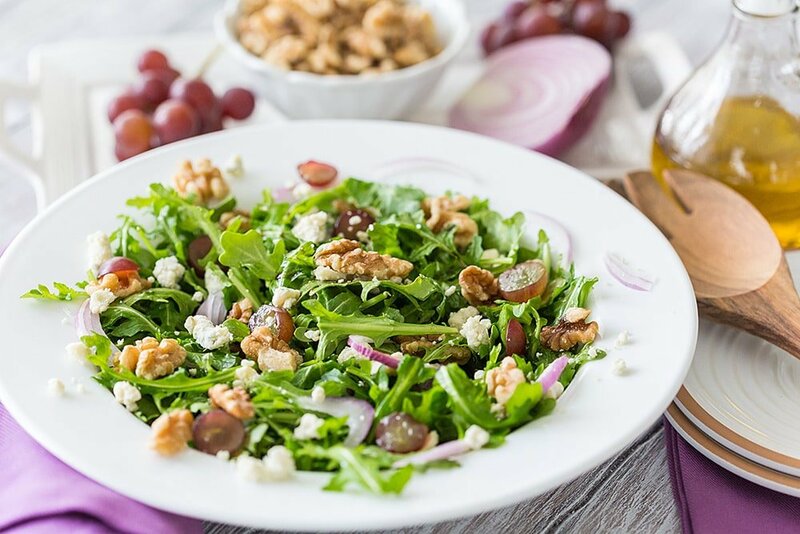 One common misconception is that all fat is bad, but your body truly needs a certain amount of good fats, such as walnuts and olive oil. This salad has both of those. Walnuts are a wonderful source of omega-3 fatty acids and rich in antioxidants. 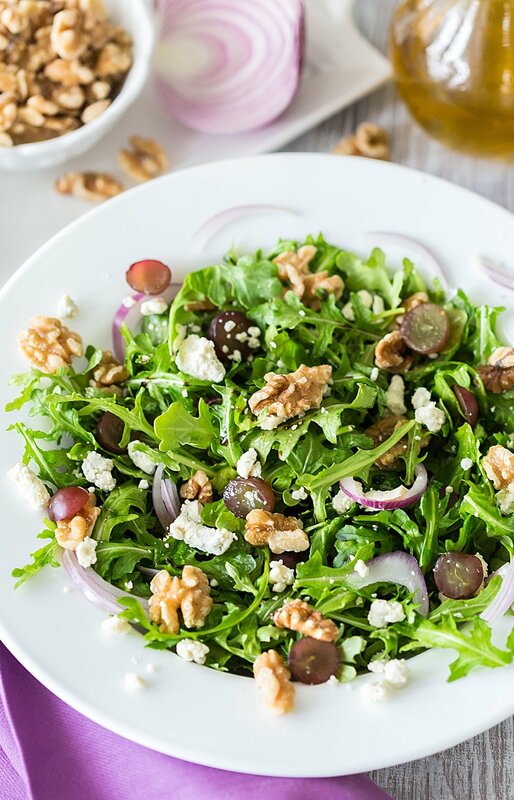 This arugula and walnut salad is the perfect lunchtime dish that can easily double as a dinner party starter. Top it with grilled salmon or chicken if you want a heavier entree-style salad. Now, if red onion and blue cheese are a bit on the strong side for you, I understand. Leave them off or swap for something milder like a feta! I love the extra zest the onion and blue cheese give this salad. They balance out the sweetness of the fig balsamic. Speaking of this balsamic, check your grocery market for any brand of fig balsamic. I’ve tried several, and they all get two thumbs up! As for the “dressing”, I like to serve it drizzle style – aka – no having to mix up your dressing in a separate container. Keep it easy! I like to drizzle with olive oil and add a few dashes of the fig balsamic. Toss and serve. Set out the olive oil and balsamic at your parties and let your guests add their own! An easy and flavorful salad that's quick enough for a weekday lunch but delish enough for a dinner party! Combine first 5 ingredients in a bowl and toss. Drizzle with olive oil and balsamic. Serve! 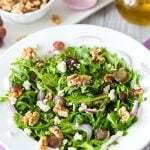 I hope you’ll try this arugula and walnut salad! Tailor it to your favorite seasonal fruits, and snap a picture to send my way. As soon as peaches are in season, I’ll share a pic of my “peach” version of this salad. Stay tuned! Meanwhile, if you have extra walnuts on hand, here are a few other favorite walnut recipes! I had a salad similar to this in New Orleans which turned me onto blue cheese — I am a big fan. However, I’m unable to eat blue cheese any more (boo) so I’ll try the feta. I might add bacon pieces too. Yum! I make it with feta often! DELISH! This is my favorite salad!